Those of you that have played rugby on more than a few occasions will definitely have (knowingly or unknowingly) encountered “shanter”. “Shanter” comes from the combination of the words “banter”, which is a witty exchange of back and forth humorous remarks meant to be amusing, and the word “&%£”. Whilst banter is a fun way for players to have fun and entertain each other, banter gone wrong is neither fun nor entertaining and should be avoided at all cost. 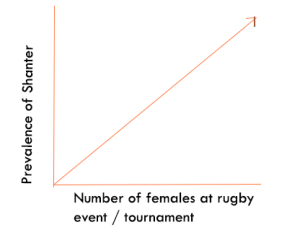 In addition to locker room antics, Shanter seems to be prevalent on the rugby sevens circuit and at local tournaments around the UK. 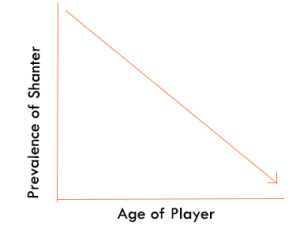 Here are some graphical illustrations of Shanter that I have observed over the course of my rugby career. Please note that there are always outliers to these trends as exemplified by the over 50 coach mentioned below. Below are what we believe to be the worst cases of Shanter. Be aware of Shanter and don’t let your banter turn bad. Rugby – whatever form you play – is a game based on respect. It is not smart or funny to aggressively taunt the opposition whilst standing on the side of the rugby pitch – this isn’t football after all. Telling players to hurt / injure/ “%Y^& Up” another player isn’t banter. It’s just rude. The worst instance that I have experienced of this type of banter gone wrong was actually led by a coach at a rugby sevens tournament that we attended a few years ago. It was our rugby sevens team’s first tournament and we were playing a much more experienced side. We put a couple of points on them at the start, which got their backs up. When they started coming back on the scoreboard their coach started leading the charge with Shanter on the side of the pitch. They made fun of our coach, who was a woman at the time, insulted our players and repeatedly told their players to injure ours. This was all done in a way that (I think) was meant to be “banterous”. It was not. It was rude and obnoxious and not at all sportsman-like. I complained to the tournament staff following the game and the coach later came over to apologise for his behaviour, but again this was not done in a sincere way. If our coaches don’t lead by example, how can we expect our players to play with respect? Set the right tone for your club and don’t let your team be known for Shanter. Almost all rugby players will have witnessed a teammate trying to make a joke or reply to a witty remark but witness how it all goes terribly wrong! Sometimes this is due to the individual taking the joke too far (e.g. a sexual joke that gets too graphic or just crosses the line into uncomfortable / not funny territory). In addition to this basic form of lad banter there is also behavioural lad Shanter – for example, stealing stuff on a night out that really is out of bounds or just acting like a prick to strangers. I see this regularly at tournaments. We will come up to players and ask them if they want a flyer about our company. They will say yes and as soon as we walk away they will fold them up and throw them out or do something equally obnoxious. If you didn’t want a flyer, then please don’t take one as it costs us money to print them and we would rather not waste them on your stupid Shanter. Next time you are with your teammates at a rugby tournament or on a night out and you are a witness to Shanter, call your friend out on it. There is no reason to cross into Shanter territory when there is so much good banter to be had!